I am loving these chewy stacks of sweetness! Give them a try! Line large trays or cookie sheets with parchment or wax paper or silpats. Measure Chex cereal into a large heatproof bowl. In saucepan, combine corn syrup and sugar over medium heat. Bring to boil then remove from heat and stir in peanut butter until smooth. Pour over cereal and gently fold together until cereal is completely covered. Scoop out onto prepared trays, I used a large ice cream scoop to make 30 stacks. When cool and set, make the topping. In microwave safe bowl, add peanut butter, chocolate chips, and butterscotch chips. Microwave on 50% power for 3-4 minutes, stirring every 30 seconds until melted together and smooth. Spoon 1 Tbl of mixture over each stack. Let set up at room temperature or put in fridge to speed up the process. Makes 30 large stacks. 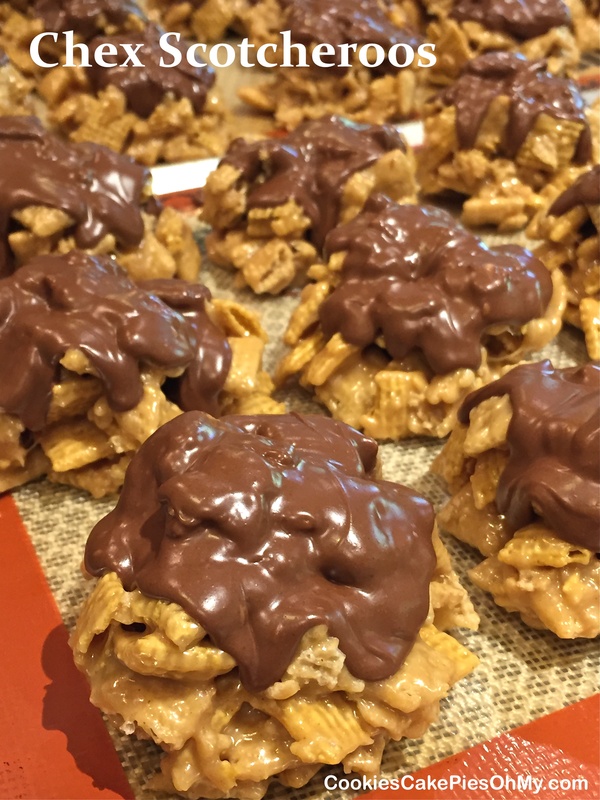 Mixture can be pressed into a sprayed sheet pan and then drizzle topping over and cut into bars. The original recipe is found at prettyplainjanes.com. I am revisiting this recipe because it is such a favorite! This time adding a couple more ingredients. Warning, once you start eating, you may not be able to stop. In large bowl, stir together Rice Chex, Golden Grahams, coconut, peanuts, almonds, and chow mein noodles. In saucepan over medium heat, stir together butter, sugar, and corn syrup. Bring mixture to boil and continue cooking to”soft ball” stage…about 235° on candy thermometer. Pour hot syrup over cereal mixture in thin stream in stages. After each addition of syrup, gently fold and stir until all ingredients are well coated. If you want to add sprinkles, M&Ms, or other candies continue stirring until cooled enough to add and not to melt. Spread mixture out onto silpat lined baking sheet to cool completely. Store in airtight container. April Fools! 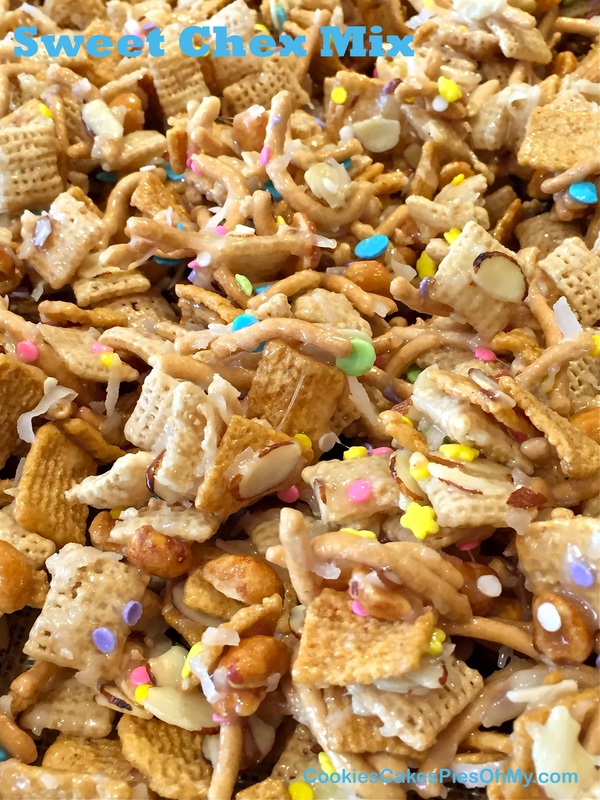 The joke is, you make this recipe of Coconut Almond Chex Mix and you won’t be able to stop eating it! It is so very good, sweet and chewy. 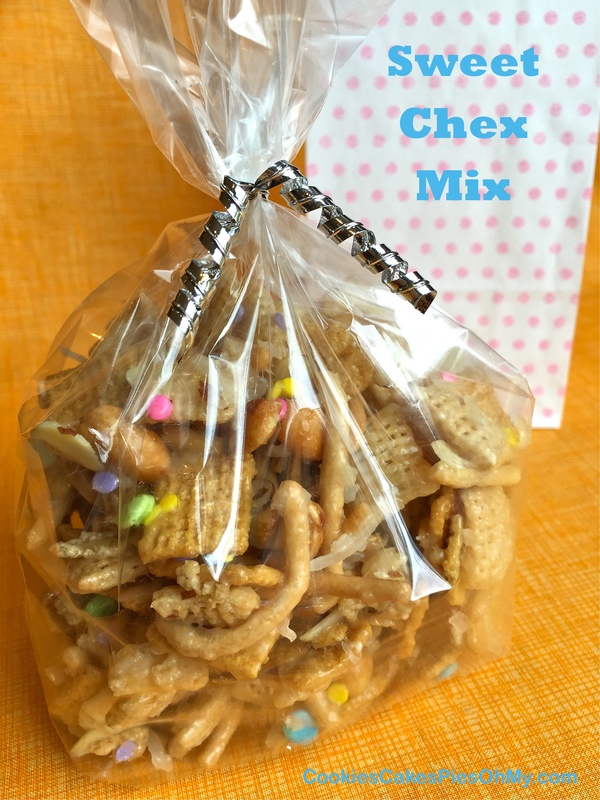 Oh dang it, in order to make this post I made this Chex Mix and it is sitting right here in my kitchen…I guess the joke is on me! In large bowl, stir together Rice Chex, Golden Grahams, coconut, and almonds. In large saucepan over medium heat, stir together butter, sugar, and corn syrup and bring to”soft ball” stage…about 235° on candy thermometer. 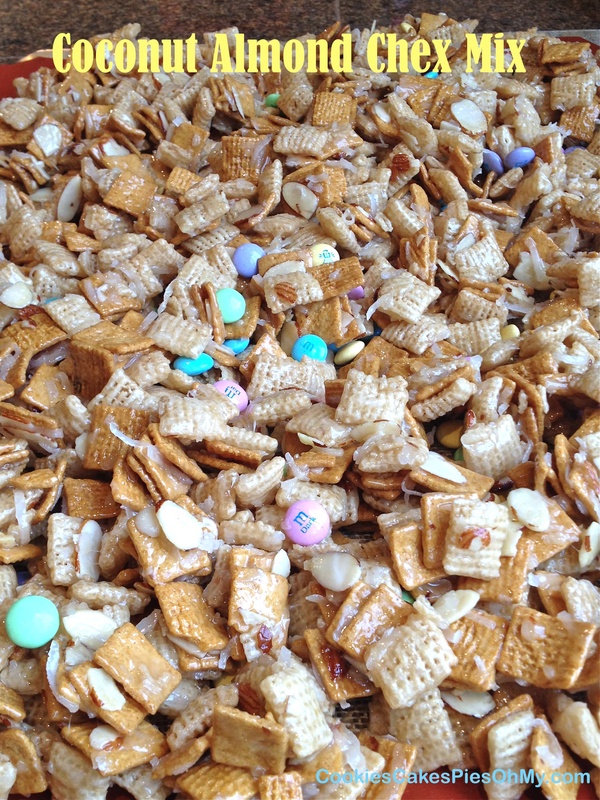 Pour over cereal mixture and gently stir until all is well coated. If you want to add M&Ms, or other candies continue stirring until cooled enough not to melt when added. Spread mixture out onto silpat lined baking sheet to cool completely. Store in airtight container.